Bill Culbert: Making Light Work, by Ian Wedde (Auckland University Press, hardback, illustrated, 272 pp., $99.99. Have lightbulb, will travel. Sculptor Bill Culbert embodies the expatriate artist condition. He left New Zealand in 1957 at the age of 21 to attend the Royal College of Art in London and has lived overseas ever since. However, after he first returned to these islands from Europe in 1978 to take up a short term artist-in-residency at the University of Canterbury, he has been to-ing and fro-ing between northern and southern hemispheres on a regular basis. And, as Ian Wedde tells us in Bill Culbert: Making Light Work, Culbert ‘travels light’ — often, apart from a carry-on bag, his sole piece of luggage is a hard-shell Samsonite suitcase ‘containing fluorescent tubes . . . or hard-to-find fixtures and bulbs.’ It’s a hold-all for odds and ends that might be useful for helping set up an artwork or an installation that involves lighting. But there’s lighting and there’s lighting. Bill Culbert is a lighting specialist of another order. He uses light in all its manifestations — ‘light-marks in space, light-in-light, light in darkness, night light, daylight’ as a kind of substance, something to sculpt with, something to paint with. As Ian Wedde observes, light enables Culbert to ‘brush’ objects and atmospheres into a state of aesthetic clarity. The way this artist salvages ordinary light playing over ordinary things, and brings it to our attention; and his devotion to light’s radiance, its immanence, seems almost priestly, like that of some old-time Platonist philosopher who sought to show the world is really crystal, a sphere through which light shines. Wedde’s thorough-going treatment unpacks, as it were, Culbert’s battered suitcase of ‘barely revealed’ presentations and perceptions, and through a series of nuanced analyses gives a sense of the multitude of fine discriminations involved in creating any given Culbert piece, whether created by the artist alone or in collaboration. Profusely illustrated, handsomely presented, and including an extensive bibliography, this monograph is the first major study of Bill Culbert’s oeuvre. Prior to its publication, the full extent of Culbert’s range and diversity of projects hadn’t been obvious in this country. The narrative aligns him with the expatriate careers of Frances Hodgkins and Len Lye, and also serves to reveal just how highly regarded he is elsewhere, and just how much critical response he has generated, particularly in France, but also in the UK and Germany. One aspect Wedde stresses is Culbert’s methodology as a product of cultural exchange. In creating, or curating, this interplay of Culbert as the epitome of the well-travelled international Modernist, yet also quintessentially Kiwi in his understated, studiously casual approach, Wedde begins at the beginning, covering Culbert’s early years (a 1930s childhood in Port Chalmers, exposure to post-War progressive art education at Hutt Valley High School, an honours degree in painting from Canterbury University’s Art School) in order to give us a sure sense of the artist’s formative factors as the maker of a particular kind of artwork. At heart, Culbert is a conceptualist, and his conceptual rigour manifests itself in his ongoing economy of means with its paradoxical richness of reference — hence his admirable adaptability and exemplary energy. Raiding rubbish dumps for discarded plastic containers, bottles, and other faded, semi-invisible objects, he injects them with light, and thus illuminated they become beautiful objects for contemplation. Yet if Culbert appears dedicated to resurrecting the simple, the humble, and commemorating the once-functional, he’s also playful with it, a subscriber to the ‘industrial optimism’ of Laszlo Moholy-Nagy, along with the subversiveness of other early Modernist artists, such as Marcel Duchamp, Man Ray, Francis Picabia, and, latterly, Jean Tinguely. Since 1961 Bill Culbert and family have been based in the Vaucluse region of Provence in the south of France, and, enlivening the French connection with the help of the tramp-like suitcase Culbert lugs hither and yon, Wedde shows how the spirit of Kiwi ingenuity finds a parallel in French peasant resourcefulness, so that Culbert’s perceptiveness is able to link the two. So, for example, when he came back to Christchurch in 1978, he travelled over to the West Coast and the rural vernacular architecture — the left-over frontier mentality — he discovered there provided validation for the repurposed found objects he was working with in Europe. Wedde chronicles, too, the metamorphosis from ‘William Culbert’, the art school student of the 1950s who painted portraits and still-lifes employing the framework of Cubism, to the ‘Bill Culbert’ of the 1960s, eye-witness to Arte Povera, Op Art and the general mood of Sixties experimentation, who had begun to rethink the presentation of the properties of surface, colour, light. Working with a camera and making ‘photo-works’ presented a way of getting beyond painting’s ‘edge limitation’, while light, which ‘filled space and went through holes’ offered something to work with. Culbert became someone who cultivated light like a primary producer, making it sprout out of sculptural devices, and harvesting its reflections and projections. And beyond stark formalism, the ‘bare bones’ of fluorescent tube or lightbulb, Culbert sought to make an art that included interaction with people, either individually as they approached, circled or were enveloped by light-making devices, or collectively as they grasped the idea of a ‘convivial space’, a congenial and relaxed environment in which they ‘shared’ the vignette of the artwork or installation. To an extent this seems like wishful utopianism on the part of both the artist and his explicator, as actually art of this kind is something of a closed shop, a narrow regard, a rite of initiation. Wedde, though, also discourses on his own relationship with and connection to the artist, and his anecdotes of their interactions do perhaps stand in for the eloquent silences Culbert’s works in situ essentially offer. Elaborating on the lightness of being Bill Culbert, Wedde describes his experience of working as a facilitator on the Ralph Hotere–Bill Culbert collaborative piece ‘Void’ (2006) — essentially just two black flat rubber discs, one on the floor, one on the ceiling — permanently installed at the Museum of New Zealand Te Papa Tongarewa and providing an object lesson in the art of paradox from two masters of the less-is-more school: ‘through the brash busy core of the building a shaft of emptiness has been installed’, but rather than being an emblem of negative space this shaft is a site of optimism, an exhilarating centre. Amidst the business of its making Wedde drafted a publicity document suggesting that this artwork ‘reached heavenward’; Culbert demurred suggesting it did not, rather it reached ‘up’. His artworks, he was saying, are not intended to be ‘literary’ or ‘metaphorical’ or even ‘symbolic’; they simply are what they are: simple and honest perceptions of the physical properties of matter, and that clear-sighted minimalism is magic enough. 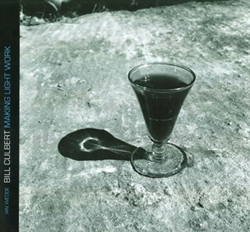 The cover of the book shows a photo-work of what has become, in a number of variants, a classic Culbert image. Sunlight shines through a bistro glass of red wine, and the literal shadow it makes forms the outline of an electric lightbulb. It is a moment of stopped time, a heliograph, the light of the sun caught as the earth revolves. DAVID EGGLETON is the editor of Landfall and Landfall Review Online.